Beside the updraft velocity at cloud base, the microphysical properties of aerosol particles play the most important role in defining the cloud droplet number concentration and further cloud microphysical and radiative properties. Therefore, it is of crucial importance to get information about those particles getting activated to cloud droplets under atmospheric conditions or remaining as interstitial particles. As part of the Airborne Cloud Turbulence Observation System (ACTOS) a light-weight and compact scanning mobility particle sizer (SMPS) was build at TROPOS. The SMPS provides in combination with a commercial optical particle counter (OPC) and condensational particle counter (CPC) a robust and well-characterized aerosol measurement unit for measurement flights in the vicinity of boundary layer clouds. Fig. 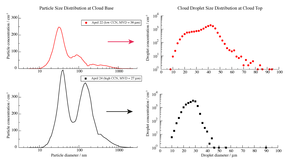 1: Left Ordinate: aerosol number size distributions inside (blue) and outside (red) of clouds. Right Ordinate: fraction of activated particles (η, black line). Shaded area marks the number of activated particles (Nact). Figure 1 shows an example of aerosol number size distributions measured inside (blue) and outside of clouds. While the outside cloud aerosol number size distributions show a bimodal distribution, typical for marine aerosols, the aerosol number size distributions inside clouds feature only a mono-modal distribution. 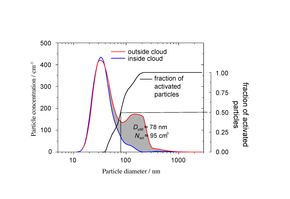 Here, particles larger than approximately 80 nm in diameter are activated to cloud droplets. 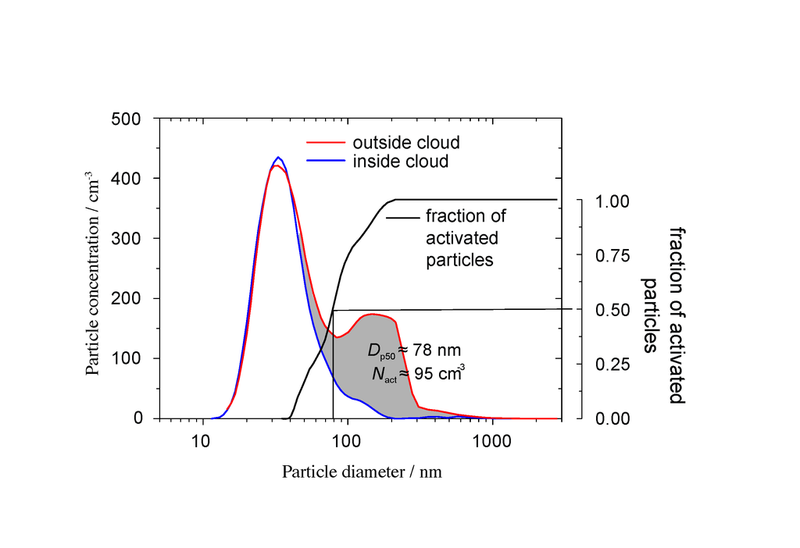 From the comparison of inside and outside cloud measurements the number of activated particles and 50% activation diameter (Dp,50) can be calculated. The above shown case was measured during the CARRIBA campaign in November 2010 over Barbados. Fig. 2: Particle size distributions (left) observed in the sub-cloud layer on Barbados for two different aerosol loads on April 22, 2011 (low CCN) and April 24, 2011 (high CCN). The right graphs show the corresponding droplet size distributions as measure. Figure 2 shows the aerosol number size distribution as measured in the sub-cloud layer during the second CARRIBA campaign in April 2011. The first example was observed on April 22 under very clean conditions with a total number concentration of 115 cm-3 compared to 265 cm-3 for April 24. The CCN number concentration at a supersaturation of 0.25% was 40 cm-3 and 160 cm-3, respectively. 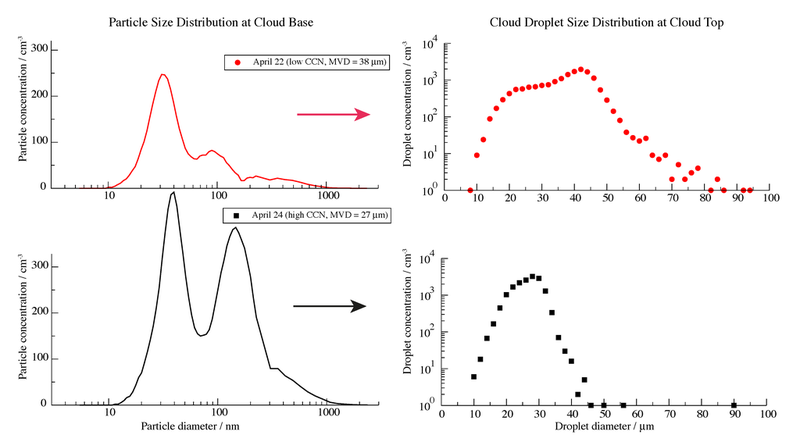 These differences in aerosol load result in completely different cloud response in terms of droplet size distributions as measured close to cloud top. For April 22, a broad distribution was measured with droplet sizes up to 80 micron indicating the onset of drizle production compared to a comparable narrow distribution for April 24 with biggest droplets around only 50 micron. These two example nicely illustrate the importance of the aerosol conditions in the sub-cloud layer fort he cloud microphysical structure of trade wind cumuli.